One thing that I can never get enough of is face primers! I love collecting primers and trying out different brands and formulations. In fact, I think foundation primers are one of the makeup products I've tried out the most in my years of wearing makeup. I've been more prone to wear primers with mattifying and colour correcting properties, but a spur of the moment made me grab the Hourglass Ambient Light Correcting Primer for a little change up in the regular makeup routine. Inspired by their iconic Ambient Lighting Powders, each primer features a lightweight, oil-free formulation that blurs imperfections, smoothes the skin, and corrects the way in which light radiates off of your skin. They are all packaged in the classic Hourglass box, and brown and gold squeeze tubes with a shade indicator on the front. There are three different primers in this collection, all of which reflect a different pigment that balances out the warmth or coolness of the skin. The three shades available in this collection are called: Dim Light, Mood Light, and Luminous Light, which is the one that I am featuring today. These primers create the first layer of light on the skin which can be worn underneath any foundation. If you wear it under a dewy foundation, then it will ensure that your skin looks radiant and fresh. If you wear it underneath a matte finish foundation, it will prevent your skin from looking flat or dull. Since all of the primers are oil-free, this means that it won't feel greasy nor will it alter the texture of your normal base finish. There are three primers in this collection, designed for all skin types and skin tones. DIM LIGHT | A beige tint that creates a soft, neutralizing peach finish to the skin that offers the sheerest amount of coverage. It works best for skin tones with a yellow undertone or medium to olive skin tones. MOOD LIGHT | A softer, pink tint that gives a subtle brightening effect to the skin. It is perfect for someone with a yellowish or sallow complexion as it would brighten and neutralize the skin. LUMINOUS LIGHT | Lastly, this is a pearly champagne shade that gives the skin the effect of a candlelit glow. It's great for fairer skin, although it would lighten and brighten all skin tones. Overall, these primers blend into the skin easily and because the radiant effect they give is so subtle, you don't have to worry about your skin looking greasy or oily. It's a perfect primer choice for occasions where you may be photographed, as it leaves your skin beautifully lit while enhancing the wear of your foundation. Your skin looks blurred, softened, and naturally radiant. 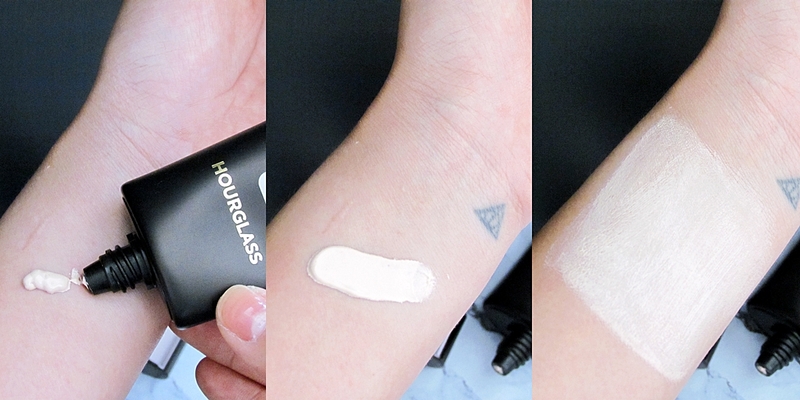 Has anyone else tried the Hourglass Ambient Light Correcting Primers? What were your thoughts? Let me know in the comments down below.